The global paints & coatings market was valued at US$ 149.79 Bn in 2017 and is anticipated to expand at a CAGR of 5.2% from 2018 to 2026, according to a new report titled ‘Paints & Coatings Market: Global Industry Analysis, Size, Share, Growth, Trends, and Forecast, 2018–2026,’ published by Transparency Market Research (TMR). The global paints & coatings market is driven by growing building and construction activities across the globe. The global paints & coatings market is primarily driven by advancements in the building & construction industry. The building & construction industry is projected growth in the next few years due to rise in urbanization and population globally. Urbanization and changing lifestyles are expected to drive the global construction industry in the next few years. Growing population and improving economic conditions have increased expenditure on housing and infrastructure development across the globe. The economy in Asia Pacific has grown in the past few years. This has led to developments in the building & construction industry in the region due to growing middle class population and improving standard of living in developing countries in Asia Pacific. Environmental regulations regarding volatile organic compound (VOC) emissions from coatings have been implemented in certain regions of the world. They regulations are particularly stringent in regions such as Europe and North America. This, in turn, has increased the acceptance and adoption of coatings that are highly productive, technically advanced, sustainable, and emit less VOCs. Several companies operating in the paints & coatings market are developing innovative products with improved properties. Players in the paints & coatings market are developing environment friendly technologies having superior performance in demanding applications across the value chain. Commonly used solvents contain significant amounts of VOCs, which are hazardous to human health. Use of solvent-based paints & coatings leads to deterioration of air quality. It can cause long-term harmful on human health. This has led to the implementation of strict norms on the use of solvent-based coatings. However, in terms of consumption, the solvent-based segment is currently leading the paints & coatings market. Regulations such as Environment Protection Agency (EPA) and Registration Evaluation Authorization and Restriction of Chemicals (REACH) in the U.S. and countries in Europe have implemented stringent rules regarding VOC emissions. Based on resin, the paints & coatings market has been segmented into acrylic, polyurethanes, polyesters, epoxy, alkyd, and other resins such as silicone, polyvinyl acetate (PVA), and vinyl ester. Acrylic is one of the most widely used type of paints and coatings. They are produced from monomers that are esters of acrylic or methacrylic acid. Acrylic resins can be used in solvent-borne and water-borne formulations. They can be thermoplastic or thermosetting in nature. They are largely consumed in architectural coatings, industrial coatings, and protective coatings. In terms of technology, the paints & coatings market has been classified into water-based, solvent-based, high solid, power, and others such as UV-curing technology. A water-borne coating is an eco-friendly surface treatment that uses water as a solvent to disperse resin employed to form coating or paint. These coatings are widely used due to their low VOC (less than 3.5 pounds per gallon of water). Coatings produced using the water-based technology are eco-friendly. This, in turn, has increased the consumption of paints & coatings. 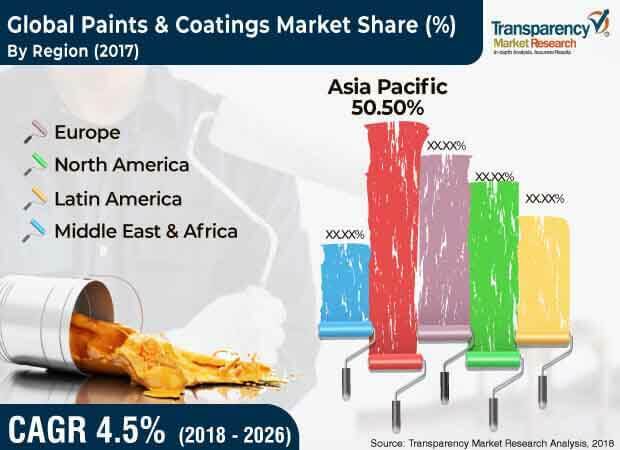 Based on application, the paints & coatings market can be divided into automotive & transportation, aerospace, building & construction, packaging, health care & medical devices, marine, electrical & electronics, and other applications such as wood working. Building & construction segment is estimated to account for a considerable share of the global paints & coatings market during the forecast period. The segment is anticipated to continue to dominate the market during the forecast period due to increase in construction and infrastructure development activities and rise in consumption of paints and coatings for decorative purposes. In terms of region, the global paints & coatings market can be segregated into North America, Europe, Asia Pacific, Latin America, and Middle East & Africa. In terms of value and volume, Asia Pacific was a leading region of the global paints & coatings market in 2017. The region is estimated to continue to dominate the market during the forecast period. Asia Pacific is also the largest producer of paints and coatings owing to the presence of a large number of producers in China. Improving economic conditions in the region are fueling the consumption of paints and coatings in the region. North America and Europe are significant consumers of paints and coatings in the world. The paints & coatings market in these regions is mature and it is estimated to expand at a sluggish pace during the forecast period due to the implementation of stringent regulations on VOC emissions. High degree of competition exists among market players operating in the paints & coatings market. The market is dominated by a few major players and is moderately consolidated. Key players operating in the market include The Sherwin-Williams Company, BASF SE, Axalta Coating Systems, PPG Industries, Valspar,, Akzo Nobel N.V, Nippon Paint Holdings, KCC Corporation, and Jotun A/S.